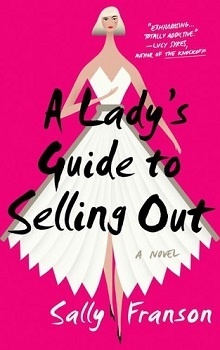 Promoted in the blurb as a sharp and satirical look at one woman’s life as she navigates dreams and reality in the world of advertising, I was hoping for more sharpness and satire as Casey’s story unfolded. Perhaps I’m not the ‘target’ for this book – a 28 year old, navel-gazing, often shallow and superficial woman, alternating her rants between the need and futility of ‘keeping up’ on social media, interspersed with moments about the mother-daughter conflicts she endured and her overwhelming need to please. But, were I to choose, Casey would not be someone in my circle, and the inability for me to form any sort of empathy for her nearly had me putting this book aside. Unfortunately, as Franson does have some wonderful moments when books and the only real relationship that Casey has, that with her friend and former college roommate Susan. But, this is often buried behind the lack of any real morality play for Casey – sure what she does (and she sees this) is ultimately sell to create a buzz, and there are few (if any) who really deserve all of the attention and hoopla that she helps to create, but it is more a function of her disengagement and inability to find an actual stance on anything. Sure she snarks and scoffs – but those real moments, where a decision to make a choice that will change the norm, rather than gloss over it with a pretty picture and soft lighting are wholly missed, and Casey seems like a set-dresser working for an Oscar, rather than someone truly bothered by, or willing to change, the way she is operating in the world. From her awareness of the disconnects to a consistent and concerted effort to ignore any way to make a difference, even a small one, the only hope for her appears with Ben, but this is soon buried, again, beneath the desperate attempts to appear ‘clever’ and ‘in tune’ while actually ignoring and fluffing over any way to improve or change her situation, her life or the lives around her. I was hoping for sharp wit and some clever insights, more in line with a satirical approach to the tale of the times we live in – instead it was sadly soft focus without any real conviction on Casey’s part to move on or forward, content in her self-absorption and stasis.